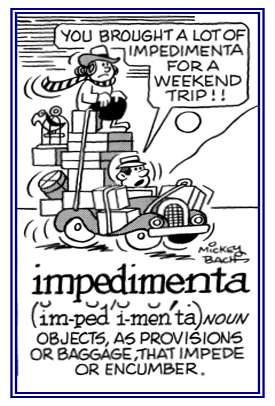 Things which encumber progress; such as, baggage or traveling equipment: Jane had to determine what would be the impedimenta of clothes, toys, etc. of her children before she could pack their two suitcases for the trip to visit their grandparents. James first had to put away all the impedimenta on his desk; including papers, pencils, rulers, paperclips, notebooks, etc., before his new computer was brought to his room and set up. The branch from the shrub is impeding the man as he is running with his dog. The quality or condition of being inexpedient; disadvantageousness, unadvisableness. 1. Not expedient; not suitable, not judicious, nor advisable. 2. Not convenient or practical. 3. Inadvisable; not recommended or prudent (formal usage). Any member of the arthropod class Diaplopoda with a cylindrical and segmented body, each segment having two pairs of short legs, of which there may be several hundred altogether in some species. Millipedes are vegetarian and, in contrast with centipedes, lack poison glands, although most kinds produce irritating fluids that repel predation by birds. 1. Having many feet; such as, animals or insects. 2. An insect having many feet; such as, a polyped or a myriapod. A multiped is having a snack. An obstruction standing in the way of achievement or progress: The rainy weather is an obstacle to George's camping trip. The route for the race was well planned with one major obstacle about half way through the course. Being short was never an obstacle to Jerry's success as a singer. That which is a hindrance or a bar to the successful achievement of something: Andrew's sprained ankle should not be an impediment to his attending the ceremonies at school. Karin worked hard to overcome the impediment of a lisp in her speech. Bonita figured the mountain was just another impediment. She was determined that there would be no obstacle to her summer hiking vacation. 1. In the game of chess, one of eight men of one color and of the lowest value, usually moved one square at a time vertically and capturing diagonally. A "lowly chess piece" is from about 1369, from Anglo-French poun, Old French peon, and earlier pehon; which came from Middle Latin pedonem, "foot soldier" from Late Latin pedonem, "one going on foot", which in turn came from Latin pes, "foot". The application of the chess sense existed in Old French by the 13th century. 2. Someone who is used or manipulated to further another person's purposes. 3. Borrowing and leaving an article as security for repayment of a loan. Showing page 5 out of 11 pages of 160 main-word entries or main-word-entry groups.